At the end of the M55, take the second exit at the roundabout, following signs for ‘Main Car Parking’. Continue past car parks and Blackpool Football Ground, heading towards the Tower at all times. At the end of the car parks turn left onto Central Drive, pass McDonalds and turn right at Albert Road traffic lights. Charnley Road is the first road on the left. 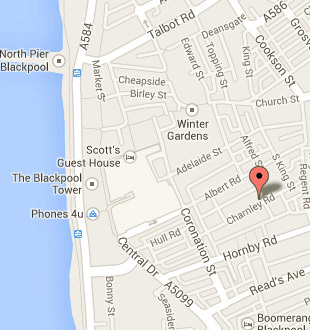 Our nearest train station is Blackpool North which is approximately 1 Kilometre away.